With the cold and rain coming to Humboldt this October, I figured that my kayak camping was over for the season. 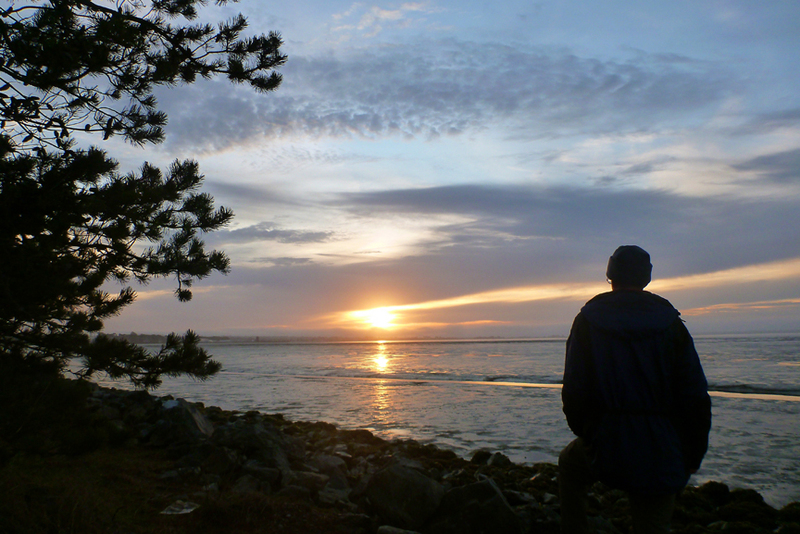 But, this Thanksgiving, the forecast looked great, and so did the tides! So, I planned on a for day/three night trip to Mad river Slough and back to Eureka. My stash of provisions allowed me to get ready in just a half day. After a turkey dinner at the Silvercrest Salvation Army Residence with Patti, I loaded the boat and she saw me off at the C Street dock in the rain. Day 1: Thursday. Showers. 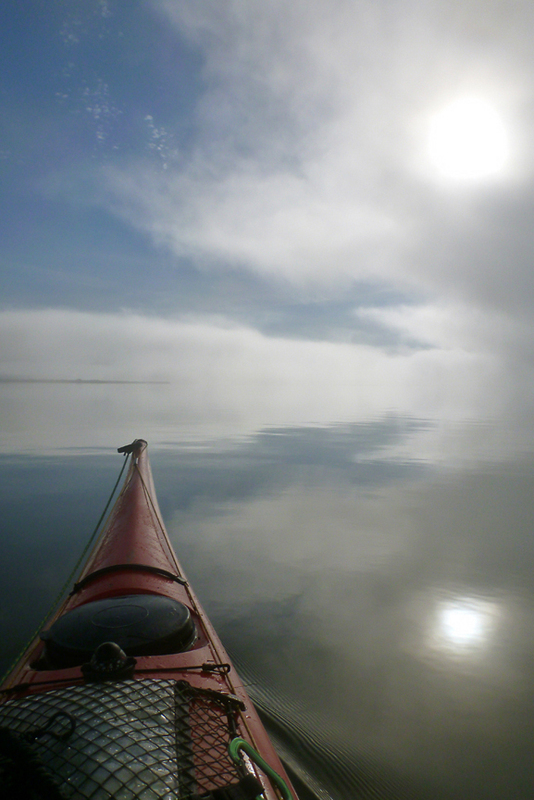 Paddled across the inner reach of the Eureka channel to Indian Island. Set up camp an hour before sunset and slept well, though it rained off and on all night. Day 2: Friday. Partly cloudy and no wind. Paddled 5.5 miles to “Humgum Island”(thanks Barry) near the top of Mad River Slough. The very high tide (8.6) had to subside before I could set up the tent. Thick fog came in that night and , with no moon, visibility was nil. Day 3: Saturday. Thick fog. 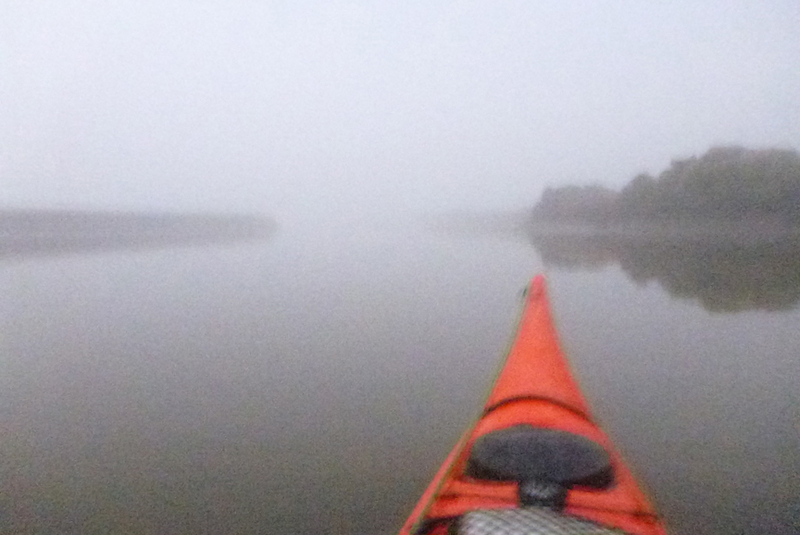 Paddled an hour down the slough towards the Mal’el Dunes parking lot. Spent 10 minutes wondering if I’d made a wrong turn in the fog. Called Charlotte on a stranger’s cell phone and had a cup of coffee. 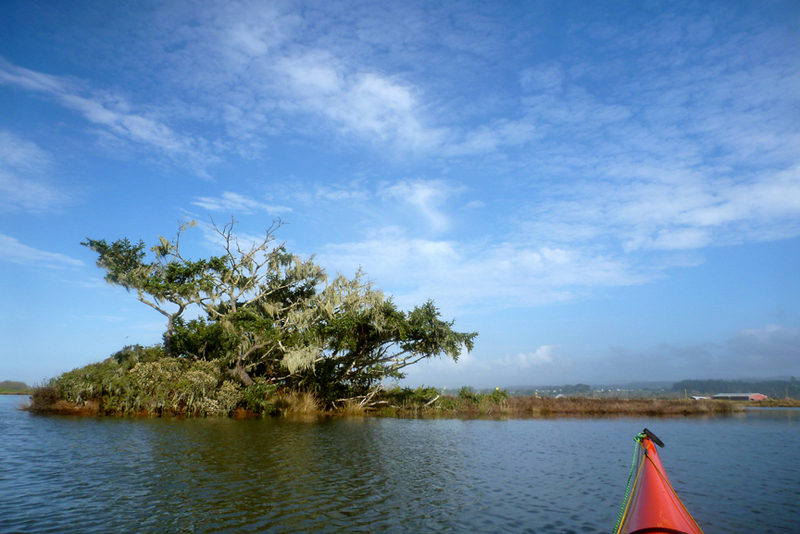 Paddled out of the slough and across the top of Arcata Bay by the compass and over to the Arcata Marsh. Met Charlotte and had lunch and Larry and Peggy showed up and so did John and Marcella. At high tide I headed for Sand Island to camp. Passed the ruins on the way. Just before I got to Sand Island I was waved off by a warning shot and a yell by a duck hunter, so I turned and paddled toward Bracut. Finished a 10 mile day by camping there. Watched a hunter bag a duck right in front of my camp before dinner. Day 4: Sunday. Cloudy, no wind. 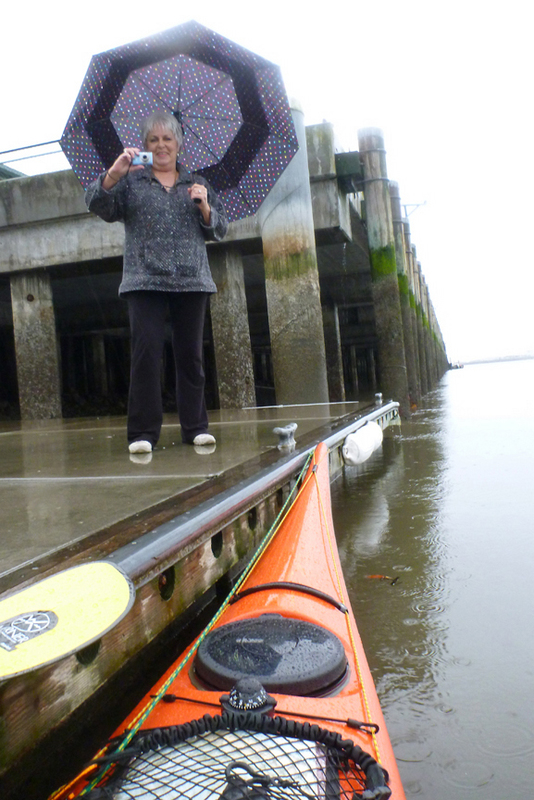 I waited on the incoming tide to give me enough water over the mudflats to paddle the 4 miles back to Eureka. Arrived at C Street at about 11:00 and wheeled my boat back home. I spent the rest of the day drying out my gear and relaxing. Beautiful trip Mark. 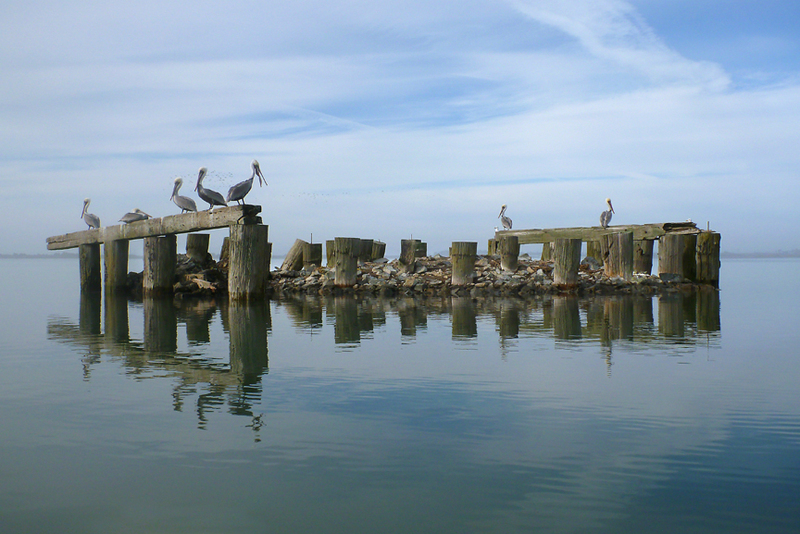 Who’d have thunk one could do a mini-expedition right here on the Bay? You’re really expanding the possibilities and making a great case for a water trail. Really great trip, Mark. And beautiful photos. Thank you for sharing it.